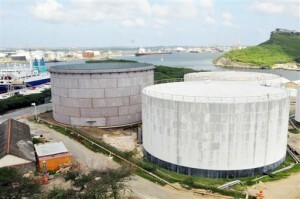 WILLEMSTAD - The new rates for fuel, electricity and water have been announced. First of all that of fuel, which starts on 5 June, as usual, the first Tuesday of the month. Gasoline and diesel prices are increasing considerably. A liter of petrol at the gas station still costs 1.90 guilders, which will soon be almost 1.98 guilders. Diesel increases from about 1.30 guilders to 1.40 guilders, 10 cents more. The prices of propane gas will also increase. A large cylinder, the content of which now costs 60 guilders, will cost 65 guilders starting Tuesday. A small propane cylinder will be 1 gulden more expensive: from 12 guilders now to 13 guilders later. Then water and electricity. The new rates go as usual on the 1st of the new month and that is tomorrow. Water becomes considerably more expensive at the lowest domestic rate: per cubic meter the price rises from more than 7.15 guilders to almost 7.50 guilders. Electricity is slightly more expensive: about two cents per KiloWatt Hour in the basic tariff. Now more than 47 cents, from tomorrow more than 49 cents.